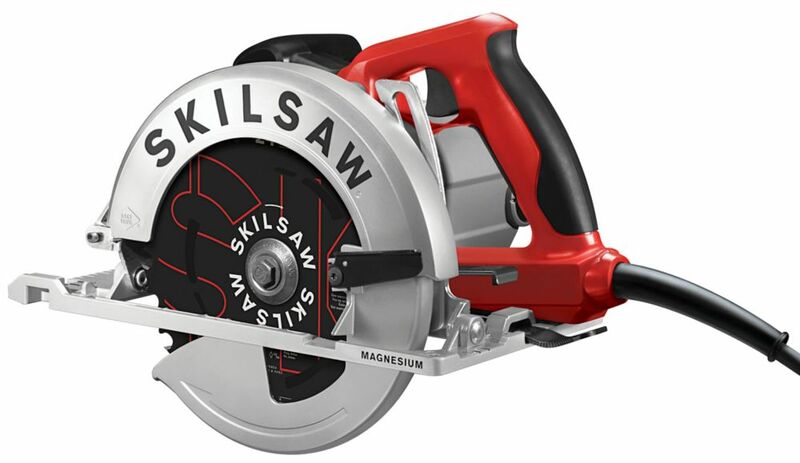 Introducing SOUTHPAW, the only All-Magnesium Left Blade SIDEWINDER Circular Saw. Made specifically for our saws and for pros like you, SKILSAW's best-in-class 15 Amp Dual-Field motor increases cooling and extends tool life. Rugged all-magnesium construction reduces weight and goes even further to dissipate motor heat. See it all: with your blade located on the left, you have improved blade and cut-line visibility for improved accuracy. Plus, with 560 precision beveling capacity, you get the added capacity for a wider variety of cuts. Now you're set up for all-day success. Count on legendary SKILSAW durability and performance to get the job done. The DeWalt Compact Corded Reciprocating Saw packs plenty of power in a compact and lightweight design and is ideal for tackling a wide range of cutting applications in tight spots, overhead and other challenging areas. Weighing just 6.8 lbs. with a 14 1/2-inch length, this tool doesn't lack in power with its 10 amp, 2,800 SPM motor and 1 1/8-inch stroke length. Designed for comfort and control, the over-mold soft grip on the handle and front boot area help reduce vibration and with the variable speed trigger, you get instant speed control. Featuring a fixed/pivoting shoe for leverage in a range of applications, use this versatile saw with confidence on your jobsite, in your workshop or for DIY projects around your home. The DEWALT DWE305 features a powerful 12 Amp motor designed for heavy-duty applications. This reciprocating saw is ideal for cutting wood and nail embedded wood, light to heavy gauge metal, drywall or plaster and plastics, rubber, fibreglass and composites. The DWE305 is backed by a DEWALT 3-year limited warranty for added peace of mind. Make custom cuts with the General International 10 inch sliding miter saw. This saw boast dual slide rails for rigidity and precision cuts using the built in laser alignment system. With a no-load speed of 5000 RPM and a comfortable horizontal D- Handle also helps with transporting. Designed with precise Bevel cuts up to 45 degrees left, this saw definitely makes the cut for your next job. SIDEWINDER SOUTHPAW 15 amp 7.25-inch Magnesium Left Blade Circular Saw with Carbide Blade Introducing SOUTHPAW, the only All-Magnesium Left Blade SIDEWINDER Circular Saw. Made specifically for our saws and for pros like you, SKILSAW's best-in-class 15 Amp Dual-Field motor increases cooling and extends tool life. Rugged all-magnesium construction reduces weight and goes even further to dissipate motor heat. See it all: with your blade located on the left, you have improved blade and cut-line visibility for improved accuracy. Plus, with 560 precision beveling capacity, you get the added capacity for a wider variety of cuts. Now you're set up for all-day success. Count on legendary SKILSAW durability and performance to get the job done. SIDEWINDER SOUTHPAW 15 amp 7.25-inch Magnesium Left Blade Circular Saw with Carbide Blade is rated 4.8 out of 5 by 42. Rated 5 out of 5 by James from Being left handed I've always been uncomfortable using "right" handed... Being left handed I've always been uncomfortable using "right" handed power tools, especially power saws. I had a project waiting so I used the New Left Blade Side Winder to cut some oak 4" x 4" 's and it performed great. Also I like the larger levers that are used to set the blade depth and the cutting angle. Rated 5 out of 5 by AJP from My husband is so happy with this saw. ... My husband is so happy with this saw. Rated 5 out of 5 by Kenneth from Great saw just what I needed for work. Believe this... Great saw just what I needed for work. Believe this is a winner. Rated 5 out of 5 by 4x4 Moses from Excellent professional-grade saw! I'm not a "lefty," but I prefer the southpaw blade placement. For a DIYer, like me, it allows me to see my cut line much more easily. And the "Southpaw Sidewinder" fits my needs, perfectly. It is lightweight, rugged, and very high quality. I just wish I could sell my old table saw and miter saw, so I could by the new worm-gear units from Skilsaw! Rated 5 out of 5 by jarewonk from great saw for the $$ Bought this on sale for $90 and has pretty much turned into stricly my Hardie saw and it does the job well. Cheap and reliable, and its a skilsaw.